There are times when you need to evaluate your own performances based on certain parameters. Here, you will need a self-evaluation form to rate yourself or mark out your positive and negative qualities. You can go through the Self Evaluation Samples given below and assess your abilities. There are different purposes for which these forms are used. Check out these Sample Evaluations to get an idea about its contents and how the questions are framed. These forms have two main sections. The short section at the top is to be filled up by the teacher. The questions in the other section are to be answered by the student. 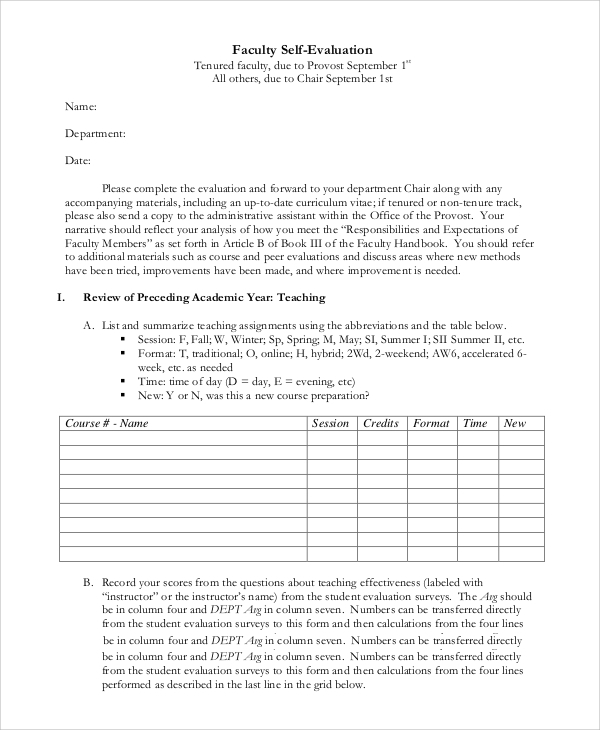 These forms are used to evaluate the preparation of a student before he appears for an internship. 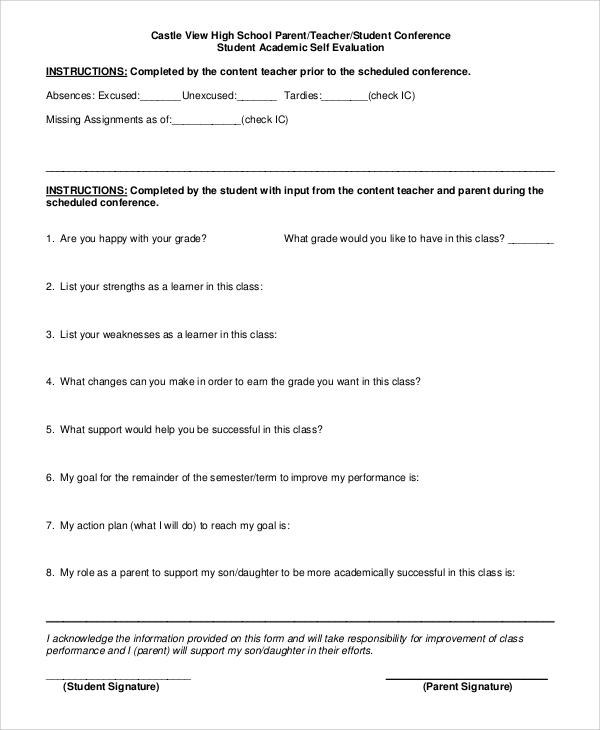 The questions have different possible options and the student has to choose the one that is appropriate for him. These forms are used to yield the response of faculties on their performance in the preceding year. There are many questions in different sections based on his performance and the candidate has to fill up the form based on his views. Why are These Documents Used in Various Institutions? It is also possible to conclude about his satisfaction level about the work environment and other aspects. The employers can find out whether the candidate realises the areas of his shortcomings or try to improve the performance. Professionals in various companies need to fill up these forms to assess their own ability to perform according to the prescribed lines. There are certain questions that are to be answered in detail, followed by multiple choice questions. 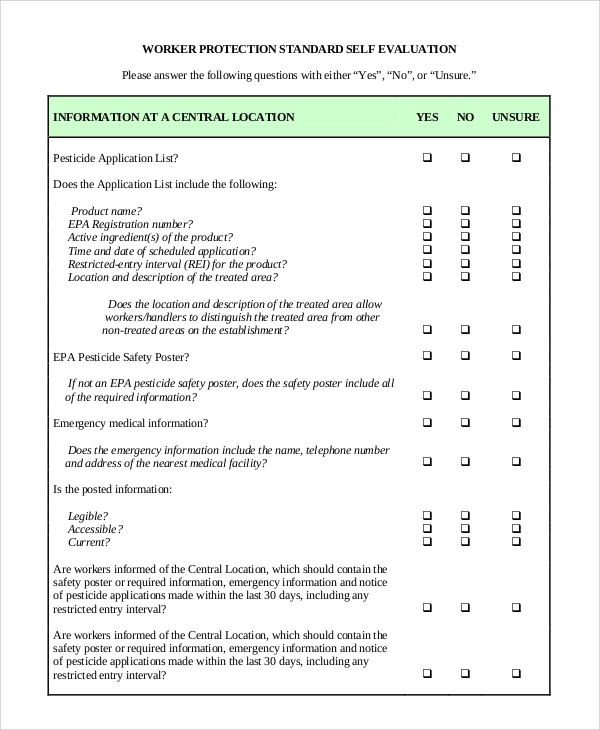 This document is divided into several sections and there are different questions for each of these sections. 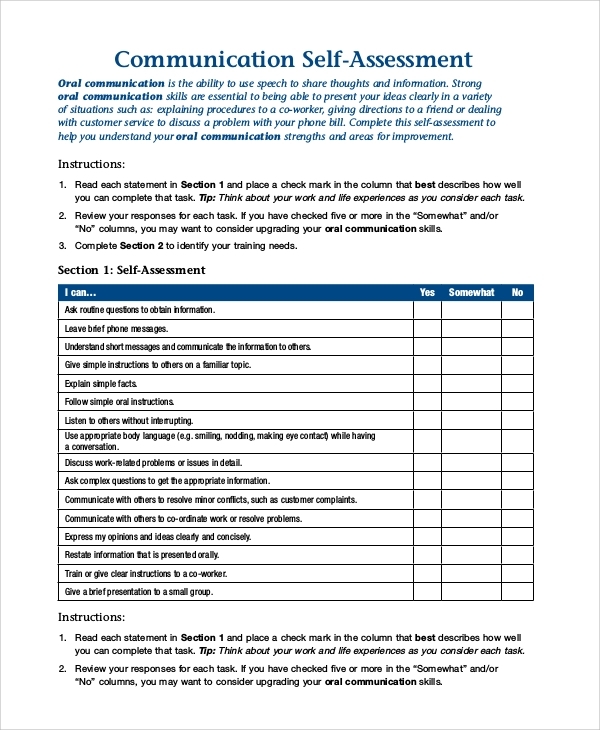 There are certain questions related to strengths of oral communication in this form. How to Make a Self-Evaluation Effective? You need to include both qualitative and quantitative information in your Sample Self Evaluation to make it more effective. You can also include statistical information to support your performance. These will help you to explain your abilities in a comprehensive manner to the authorities. You can provide your feedback about the key accomplishments that you have achieved throughout the year. 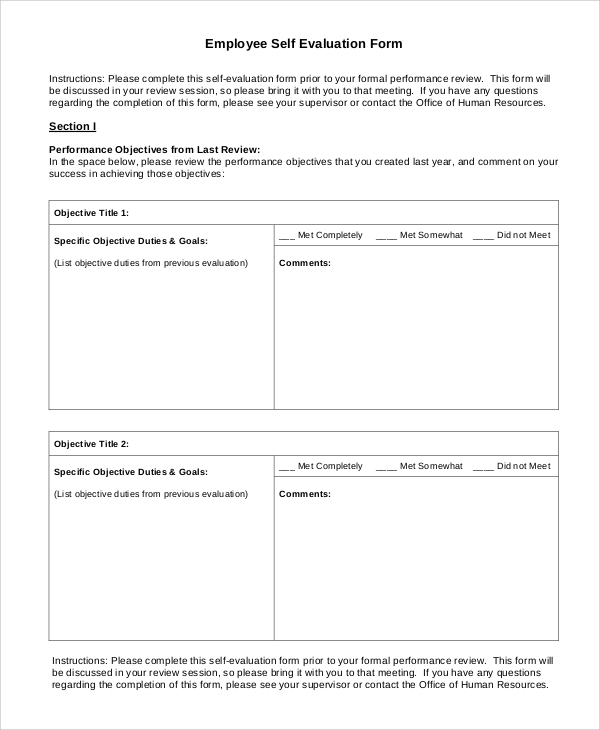 In the case of a student’s self-evaluation, the person has to make a list of his awards, prizes and accomplishments throughout the academic session. The main focus lies on how you are different from the others, so make sure that you specify how you are unique. How Does a Self- Evaluation Assessment Benefit a Candidate? 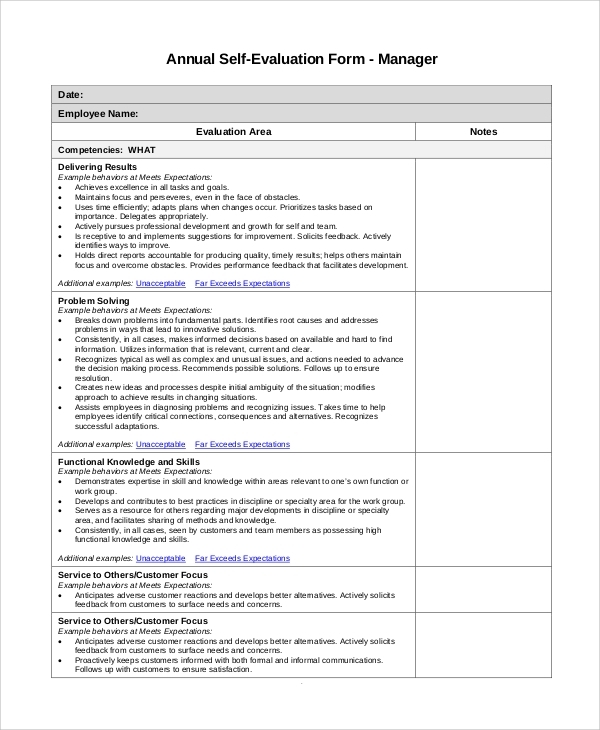 The students and employees benefit a lot from Self Assessment Examples from time to time. You can go through the Sample Assessments in order to know about the nature of questions that you may have to answer. These questions help you to evaluate your behavior and professional performance, and guide you to stick yourself to the desired lines of performance. The person can conceptualize on the areas of his strengths, weaknesses and expertise. 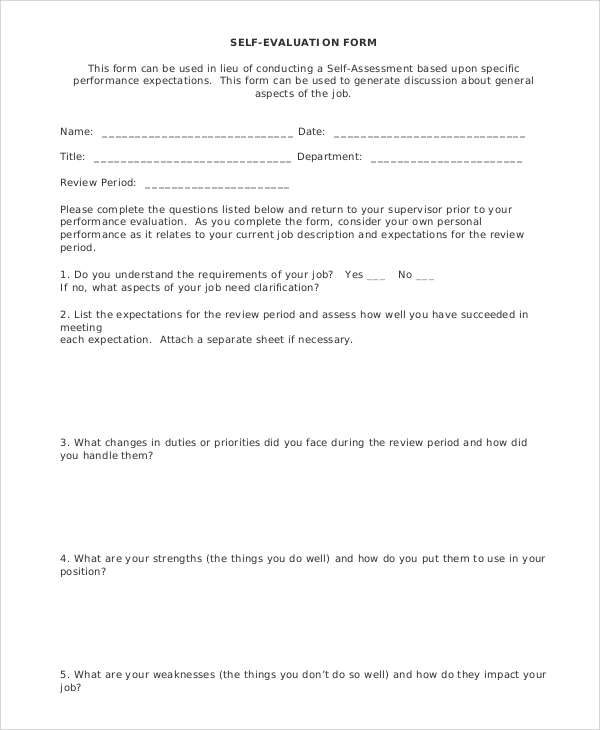 In case you have to prepare yourself with a discussion on performance review with the recruiter, these forms help you to scan your abilities and make sure that you are aware of your academic or professional performance. 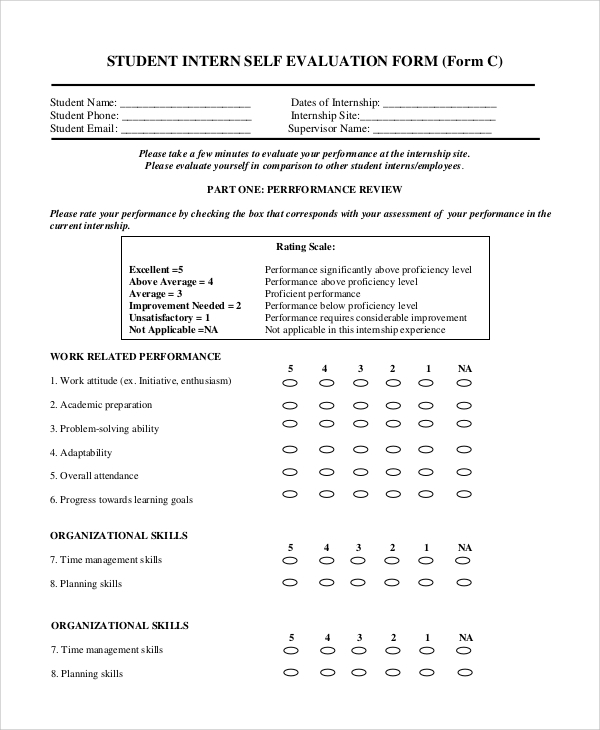 The Sample Work Performance Evaluations in the website are vast and varied. You will come across different formats or questioning and get an idea about how these are to be answered. 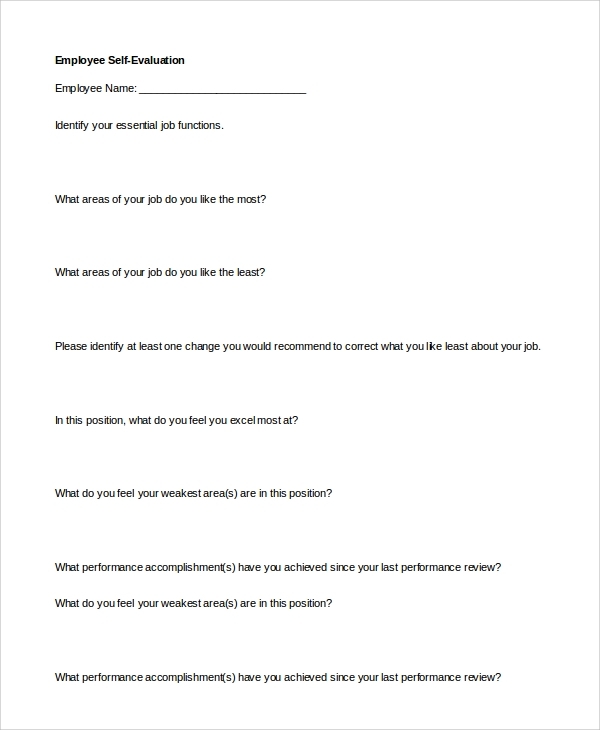 You may also download a Sample Employee Self Evaluation Forms in case you need one. You are free to customize all the templates in the website.